Roger Kemp is a professorial fellow (working part-time for the University). For several years he was Course Director of the postgraduate programme in Safety Engineering and lectured on UG programmes in electrical engineering and project management. He is also a regular contributor to the MSc programmes in Energy and the Environment in LEC. When he joined to University, he was particularly involved with energy use in transport and contributed to the Department for Transport white paper on sustainable transport. His earlier research interests also included the safety regulation of the nuclear industry as well as the energy use and safety regulation of transport systems. Roger spent 4 years on the Engineering Policy Committee of the Royal Academy of Engineering and is a member of the IET Energy Policy Panel. He has provided advice for government departments and has given evidence to select committees. He has been an invited speaker at many conferences on energy use and is an Associate of the Cambridge Electricity Policy Research Group (EPRG). He was a member of a review group for the Chief Scientific Advisor on the use made of science and engineering in government, has chaired Royal Academy of Engineering working groups investigating the impact of the widespread adoption of electric vehicles and heat policy and has undertaken research for the Energy Technologies Institute on carbon reduction through modal shift. Since 2012, Roger’s research focus has shifted to the future architecture of the GB electricity grid. The present network is basically the same as that inherited by the privatised industry from the CEGB and was designed for one-way transmission of electricity from large central power stations to passive consumers. Over the next decade, this will change dramatically as central power stations are retired and more use will be made of distributed renewables. With an increase in controllable loads, including the Internet of Things, smart systems and many thousands of new generators and “prosumers” the traditional command and control systems that worked with a few large generators will no longer be fit for purpose. He has contributed to the IET Power Networks Joint Vision (PNJV) work identifying this and undertook a study, funded by DECC, on how other sectors managed the technical architecture of a disaggregated system. He has also contributed to the National Grid activities on their System Operability Framework. 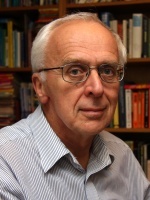 He was a member of a working group established by the Royal Academy of Engineering to investigate the limitations on the penetration of wind energy, and was a member of the Project Delivery Board of a major study, funded by the Energy Systems Catapult, on GB’s Future Power Systems Architecture (FPSA). Before joining the University in 2004, Roger was UK technical and safety director for Alstom Transport. He has worked extensively overseas on metro and high-speed rail projects and spent several years in Paris, latterly as project director of the consortium that designed and built the Eurostar trains. In 2016, he was awarded an MBE for services to engineering. Kemp, R. J., 1/01/2019, In : Communications Law. 24, 1, p. 24-33 10 p.
Kemp, R. J., 07/2018, In : Digital Evidence and Electronic Signature Law Review. 15, p. 33-47 15 p.
Kemp, R. J., Azapagic, A., Hall, J., Heaton, R., Ocone, R., Shah, N., Smith, P., Swithenbank, J., Chilvers, A. & Jeswani, H., 1/07/2017, UK: Royal Academy of Engineering. 92 p.